How far is too far to ride to catch some fish? With the memory of our latest outing on the Deschutes fading, I was itching to get a fish on the line once again. 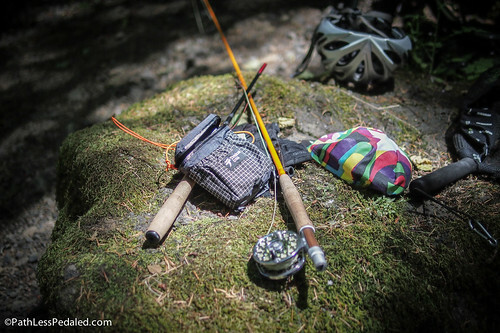 Looking back at routes we’ve ridden, we were looking for someplace we could get to in a day’s ride that would provide good fishing opportunities for Laura’s tenkara rod and my 4wt fiberglass rod. One possible place that has always stood large in our minds was the Nestucca River. The last time we rode there, I wasn’t really into fishing. I did vaguely remember the river and that the campsites had looked nice enough. 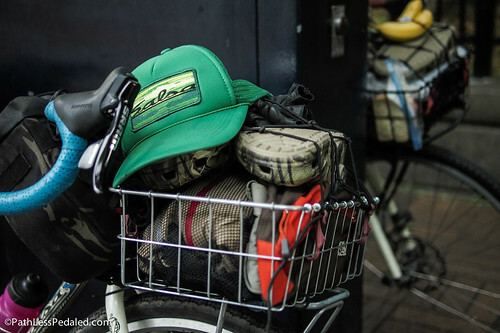 Waders, Crocs and fishing gear all in the basket. 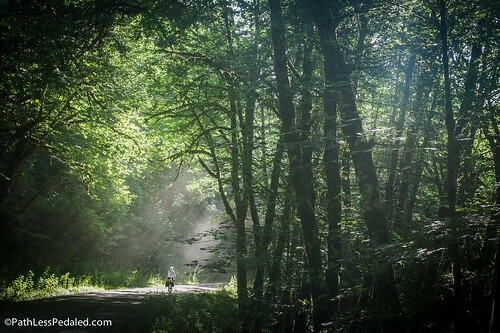 Nestucca River Road (or Meadowlake Rd as it is called out of the quaint winery town of Carlton) is a lesser known way for cyclists to get to the coast from the Willamette Valley. 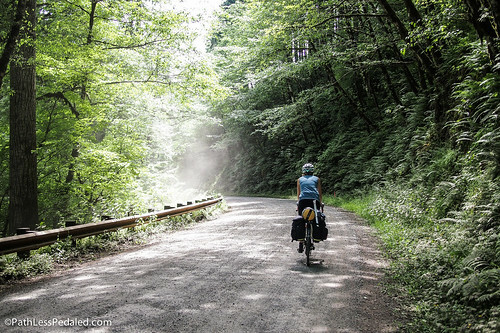 A short portion of the road is gravel, which tends to deter heavy thru traffic and makes it ideal for riding. But, there is still the matter of the coastal range to get up and over. 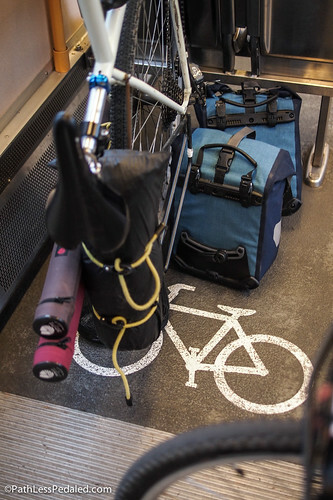 You say light rail, we say adventuremobile. We decided to head out on Sunday morning. With summer in full swing, we didn’t want to compete for campsites and with traffic so we headed out when most would probably be heading home. We cut out a lot of suburban city riding by taking the MAX out to Hillsboro. 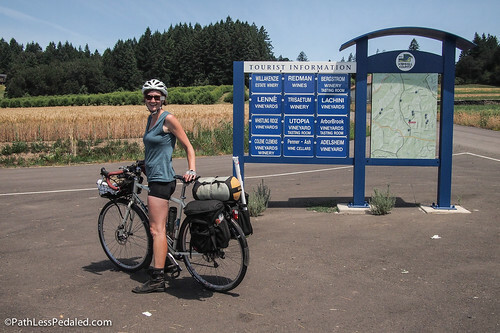 From Hillsboro we rode few miles West on Hwy 8 which has a wide bike lane to just outside of Forest Grove, where we took a series of small roads that paralleled Hwy 47 South. This is the heart of Willamette valley wine country. Every few miles, it seemed, there were signs for a vineyard or a tasting room. The topography, as you would expect for the area is a series of gentle rolling hills. Flat enough to keep up a decent pace even when loaded, but hilly enough to keep the riding interesting. 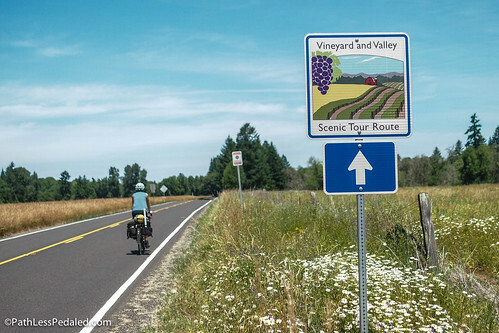 Pedaling through the heart of Oregon’s wine country. More than a few wineries here. We got up around 6am to get an early start and by the time we reached Carlton, we were glad we did. The temperature was rising and so was the amount of traffic. School was out and it’s tourist season, so there was more traffic than we would have liked on some of those shoulderless country roads. For the most part, drivers were well behaved but there were a few instances when someone would insist on pushing their luck and pass us on a blind curve instead of waiting five seconds. By the time we got to Carlton, we were ready for a break. Thankfully, there is an AMAZING bakery in Carlton (I would almost brave the traffic again for those cinnamon rolls!) where we stocked up on some pastries and Stumptown coffee for the climb ahead. From Carlton, we hopped on Meadowlake Rd and made the slow grind up and over the coast range. Most of the riding is at a reasonable 5-8% grade, but there were a few pointy bits that got into the double digits. 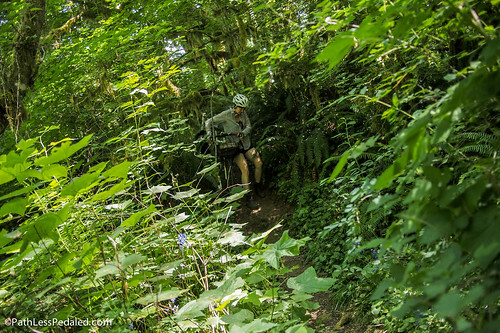 If anything, the climb is more of a war of attrition with gravity than it is a series of steep ramps. Thankfully, the latter half of the climbing is under tree cover which kept us sheltered from the sun that was now at full force. Although it was long and tiring, we were climbing pretty well. It is funny how your memories of a ride from years ago can be so different from the present day reality of it. The climbing wasn’t as bad as we remembered and there were whole sections of the ride we had completely no recollection of. Meadowlake eventually turns into Nestucca River Rd which eventually turns into a short stretch of gravel. The summit came just in time. I had run out of water and we were both feeling a bit fried from the heat. As we descended we stopped into a few of the BLM sites looking for a good place to camp. We were targeting Elk Bend, but when we got there the layout was less than the ideal with campers stacked on top of each other. 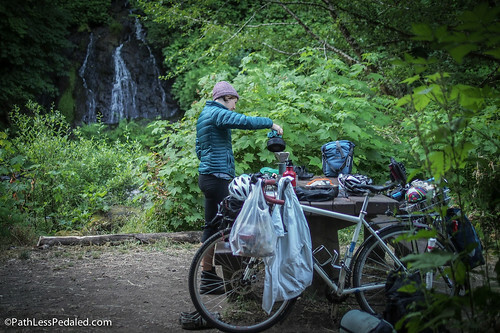 Instead, we rode a little further and camped at Alder Glen and settled on a ridiculously awesome campsite with a tiny tent pad beneath the canopy of a tree and the perfect view of a waterfall across the river. The site definitely made the trip worthwhile. 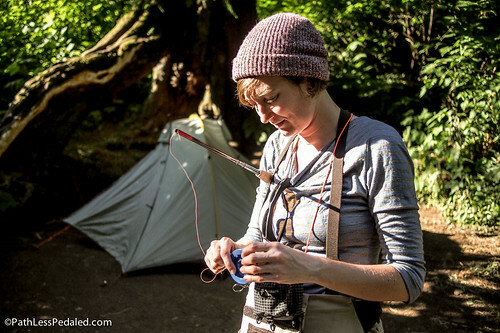 Laura stringing up her tenkara rod at our awesome campsite. We setup camp and filtered water. I took a quick dunk in the river to cool off. After sufficient calories were consumed (in the form of salami), I strung up the Butterstick to check out the water. We had nearly followed the entire length of the Nestucca river from the summit where it barely looked like a puddle to something more fishable. The stretch along the campsite looked promising with a decent current on the far bank with lots of structure for fish to hide behind. At its widest, the river was maybe 30 or 40 feet. 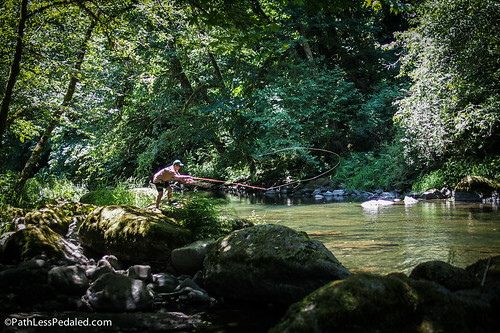 The Nestucca at this time of year and at this stretch was perfect small water fishing…if only the fish were a little bigger. Fishing is a lot like walking down your neighborhood and knocking on doors to see who is home. I started knocking. It didn’t take long until I had a pretty little cutthroat on a dry. Not a big fish by any means at 6 inches, but apparently a pretty good size for this stretch of water. After a few more missed takes from small fish I walked back to camp. We were both pretty exhausted. The mileage for the day was 56 miles with 3600 feet of climbing with nearly all the uphill at the end of the day. It was the evening of the Solstice, the longest day of the year, but by 7pm with the sun still blaring brightly in the sky we were wondering if it wasn’t too early to go to bed. We managed to stay awake until 9pm, when we called it a night (even though it was fairly bright out) and slept to the sound of the waterfall from across the river. We had set aside one full day of fishing for this trip, which I think is the best way to do it. Usually the first few hours on a new river are just about feeling it out and getting use to where the furniture is. There’s almost as much observation going on as fishing. What bugs are present? Are there any risers? Where are the deep pools? You look, you listen and then take some educated guesses. 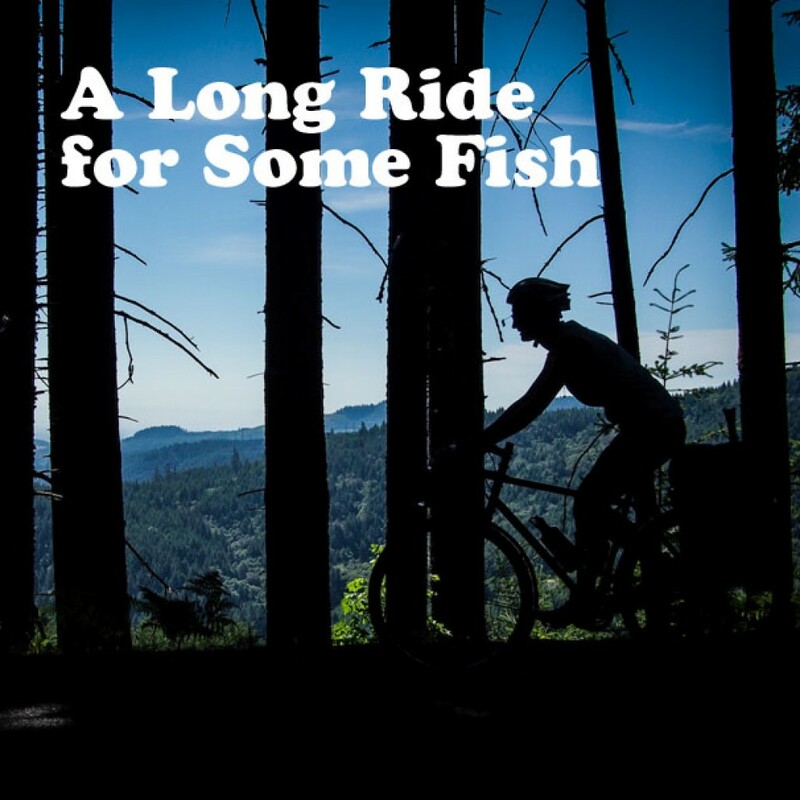 Laura being a good sport about this #bikefishing thing. We decided to pedal down the road a few miles and check out the river downstream. There were some promising spots, but there were also a lot of private property signs (something else we didn’t remember from our last ride). We eventually settled on a turnout that had a trail down to the river. After a little hike-a-bike we ended up on an idyllic gravel beach and decided to kill a few hours there. 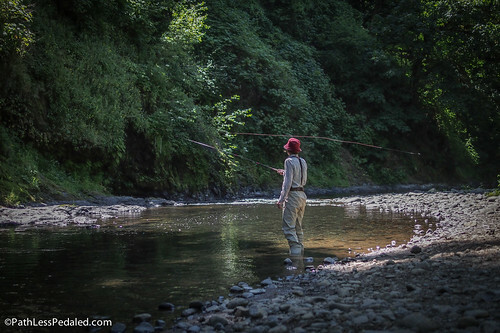 It was classic trout water with riffles leading into deeper pools. It should have been easy and obvious but the most we got were some half-hearted looks from fish too small to get excited about. At worst, we ended up having a nice picnic by a beautiful stretch of water with no one else around. 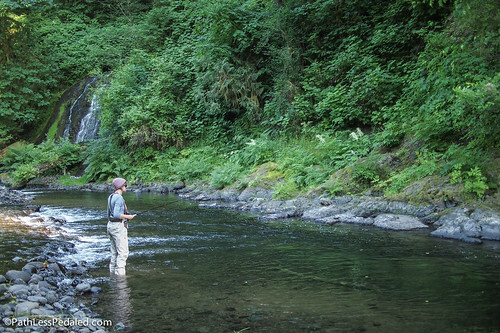 It was as perfect as any trout stream you could dream of. We rode back for afternoon siesta, made a little #coffeeoutside and waited until things cooled off. We fished the water along the campsite quickly and efficiently. Laura hooked into a small but fiesty cutthroat complete with aerial acrobatics that put a nice bend in the tenkara rod. Outside of a few minor exclamation marks in the day, the fishing was slow and the fish we did get were small. Camping across from a waterfall is always good for the soul. East meets West. Fishing both tenkara and western fly styles. It was easy to get a little disheartened when we started to do the calculations: 56 miles, 3500ft over the coast range in the heat for some small fish. I’ve found that it is best to get philosophical at times like this. We were camped out in some beautiful country and for the last three days the sound of traffic had been replaced with the sounds of the river. There was no cell phone service where we were, so there was nothing to do but the bare tasks at hand: make coffee, fish til dark, eat dinner and drink bourbon while staring at a campfire. I even tried to find some solace in the fish we did catch and the way they took a fly with a sort of heartbreaking innocence. Tomorrow we would climb the coast range again and ride through the valley in the heat of the day to get back into the city. There would be plenty of time for worries and frustrations. All the time in the world, in fact. But for now, we had this small river and these small fish.